Wars come and wars go, but the bombs remain. 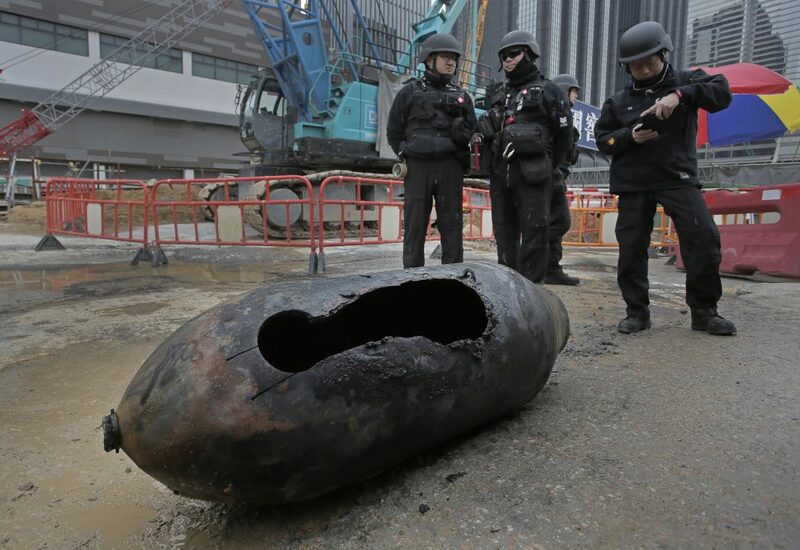 Police and explosive ordnance disposal technicians removed a 1,000-pound bomb that failed to explode during World War II but that successfully brought traffic to a standstill Wednesday in a bustling Hong Kong neighborhood. It was the second bomb discovered in the area just this week. Untold millions of explosives have been sown into the ground in just about every conflict since the Civil War, lurking under the feet of the descendants of those who dropped bombs from airplanes, hurled cannonballs, buried land mines or fired artillery. They represent perhaps the most dangerous and enduring connective tissue between history and the present. The particular bomb found in Hong Kong, a U.S.-made AN-M65, salted the earth in one of the Allied bombing campaigns against Imperial Japanese troops that occupied the region during the war. It works like this: An aircraft releases the bomb, a fan on the tail and nose whir in the air, turning a number of times until the fuse is primed, which detonates a small charge to set off the explosive power of the main charge. That did not happen in this case of a dud. Seven decades after it was dropped, the discovery of the bomb by a construction crew sparked a mass evacuation of as many as 4,000 people as ordnance disposal experts worked overnight to safely remove the bomb in a “dirty, difficult and dangerous” operation, the BBC reported. Leftover explosives constitute “an enormous problem” across the world, said Brian Castner, a former Air Force officer who wrote two books after his two tours in Iraq. Castner told The Washington Post that the scene that played out in Hong Kong is a common one across Europe, Asia and even the United States, where the Civil War was the first conflict in which explosive shells were widely used. “A lot of these places know it’s coming and have a procedure in place,” he said. In Hong Kong, a cordon was established to give technicians room to work on the bomb buried in several feet of compacted dirt. Bombs grow more unstable with age as chemical changes occur, and deterioration of the fuse means the most volatile explosives in the bomb are that much more sensitive if struck by, say, a piece of construction equipment. That makes older bombs often more dangerous, not less, as they age. Given that instability, a method called controlled detonation — essentially blowing up the bomb with another explosive such as C-4 — is the preferred method for disposing of a bomb like this. But Hong Kong is one of the densely populated places on Earth, making that a poor choice for a bomb designed to destroy buildings, Castner said. Navy bomb technicians who removed a similar bomb in Guam estimated that the blast wave would extend 3,000 feet, with bomb fragments launched as far as 5,000 feet — nearly a mile away. Castner reviewed photos from the scene and concluded the technicians pierced the casing either with a blow torch or a small shaped charge, then burned out the explosives. The process took about 24 hours, the BBC reported. Civilians are often the unwitting bomb detectors for mines and duds left over from past conflicts. The advocacy and bomb-clearing organization Mines Advisory Group estimates that explosive remnants kill or maim 18 people a day, many of them curious children on old battlefields in countries such as Vietnam and Colombia. In Laos, regarded as the most heavily bombed country in history per capita, the United States dropped 2 million tons of ordnance over nine years ending in 1973 — equal to a full payload dropped every eight minutes, 24 hours a day, according to the advocacy group Legacies of War. In Vietnam, a collection of global nonprofits, the Vietnamese government and U.S. groups have focused on removing cluster munition duds and other bombs that have killed 40,000 people. One Vietnamese official said it would take 300 years to remove every bomb. The bomb found in Hong Kong was similar to another bomb discovered nearby this week. In 2014, a massive 2,000-pound bomb was disposed of in the posh Happy Valley district. They were all safe operations, but the danger is constant. In 2010, three German bomb technicians were killed, defusing a World War II-era bomb found at a construction site, sending shrapnel hundreds of meters away. The United States is not immune from the danger. Bombs dropped in practice rounds off North Carolina’s coast during World War II have washed ashore, and the near sea floor is littered with bombs and depth charges as a result of submarine warfare. In 2008, an American artifact collector was killed restoring a cannonball, one of the estimated 1.5 million artillery rounds and cannonballs fired in the Civil War. Estimates say as many as 1 in 5 were duds, some now buried in the ground and threatening under future construction projects in Virginia, Pennsylvania and elsewhere. “The last person to die in the Civil War has not been born yet,” Castner said.